Planning an exhilarating 4x4 independent safari motoring holiday experience, exploring the rugged National Parks of Kenya, is easy. All you need is a computer linked to the internet. Having booked my plane tickets to Nairobi I hired a 30 year old pimped classic Range Rover from Roving Rovers, a car rental service specialising in old Land Rovers. It was a bit like the American rent-a-wreck concept but with a difference. Kenyan rally driver Toon Hanegraaf, started Roving Rovers. The company offers vehicles, with or without a driver and with or without safari camping equipment. These fully serviced 4x4 vehicles may be old but they can handle the riggers of the African bush with ease. They have been converted to cope with demanding off-road usage. The mustard coloured Range Rover I hired had sturdy coil springs, heavy duty gas shock absorbers, exhaust snorkel, thick tread off road tyres, and an internal roll bar cage. The roof had two flip up covers that enabled the front and rear seat passengers to climb up onto the roof for a better view of the African Wild life. In the hot high altitude tropics there is a danger of mechanical fuel pumps failing. The only first aid remedy is to wrap a moist cloth around the fuel pump and drip cold water on it. Our vehicle had an electrical centrifugal back up fuel pump installed in line with the present mechanical membrane pump. A must do conversion for overland travel in this sort of environment. A custom switch was fitted on the dashboard. It turned on the back up electrical fuel pump if the mechanical petrol pump became too hot. It immediately restored the fuel supply. I was concerned that the company did not offer comprehensive insurance as an option in their rental agreement. I did not want to be stung with a big bill if I accidentally dented part of the body work. When I phoned I was told that comprehensive insurance was not needed. The cars were so old that any damage was banged out by their own workshop or a new section was bolted on from the collection of spare parts they had accumulated in their yard. What a refreshing concept. Renting an old car, rather than a flash new car, is a safer option in Africa. You are not targeted by car-jackers. They are interested in stealing new BMW's, Mercedes and air conditioned Toyota Land Cruiser, not dusty, dirty, dented old Land Rover Defenders or Range Rovers. Buy an AtoZ map book of Nairobi, arrange for a mobile phone from the car rental company to help with any breakdown Also bring compass that works inside a car. Go to a chemist back home and buy a safe needle kit. Look up the Kenyan Flying doctor service on the internet and buy temporary membership of Kenyan Flying Doctor evacuation service for the period you are out in the National Parks. Join the Kenyan Automobile Association breakdown service for additional protection. You must have all the necessary injections before you go. It would be suicidal not to. The take time so go to your doctor a few months before you leave. Find out the price of the full course of injections and pills. Then phone around to other practices to see how much they would charge. I saved 200 British Pounds to have my family vaccinated at another Doctors one mile away from my normal Doctors practice. Go to the chemist and ask for a safe needle kit. You do not want to catch a disease from reused needles if you need a blood transfusion following a road accident. Big companies like boots sell them as part of a first aid kit. Pack them in your main luggage and not as hand luggage. They are not cheap. The injections and pills are also very expensive so phone around. I have already mentioned the Flying doctor service but just to remind you log onto their website and pay for temporary membership of the Kenyan Flying Doctor evacuation service for the period you will be away. It gives you piece of mind that if you slip and break a leg you will be flown to a modern hospital in Nairobi and not have to endure hours of agony in the back of a vehicle on a very bumpy road. Most adults in Kenya only earn $2.00US a day. It is a poor country and in my experience people are really happy to receive some small gift. They appreciate everything they can get. Bring with you gift's like baseball hats, old football (soccer) t-shirts, small toys, ballpoint-pen's, pencils, colouring pencils, pencil sharpeners, paper note pads to write on. The children don't have much school equipment and the parents have to pay for all school equipment such as paper and pencils. Look around your house for unwanted items that could do with a good new home. I had some old film cameras I no longer use. They were much appreciated as Kenya has not gone digital yet. The normal Kenyan people are some of the friendliest I have met on my travels around the world. If you are not on a tour or picking your hire car up from the airport try to take the airport shuttle city hopper into Nairobi. There is no train or metro link. These city hopper busses are cheap. Do not get on a mataus shared minibus taxi. They are driven by maniacs and the passengers are crammed in like sardines in a tin. They are death traps. If you are driving a hire car give them a wide berth. They do not abide by the rules of the road. They will cut you up to get where they are going too fast. Do not react to their bad driving. Just let them pass you. Be careful if you decide to take a taxi from the airport. It can take up to an hour to get into the city if the traffic is bad (which it normally is). As the meter is running all the time this small trip could turn out costing you a lot of money. The mornings and evenings can be cold so take a fleece. The Rift Valley area although flat is very high. The altitude in the Valley floor in some places is higher that the tallest mountain in Britain. You may get fog as well as rain so be prepared and take a rain coat. It can be extremely hot during the day so dress sensibly. Do not expose too much skin to the scorching sun without high factor protection sun screen. Always wear a hat. The sun is above the top of your head as you are near the equator. You can get badly sun burnt along your hair parting. More mosquitoes come out in the evening so have a pair of light weight trousers and some long sleeved shirts to wear whilst you are sitting around the bar or campo fire in the evening. Driving my own vehicle on safari gave me the freedom to go out into the bush for as long as I wanted, as many times as I wanted. The only restriction was that I had to be back in the Lodge by night fall as per the National Park Regulations. 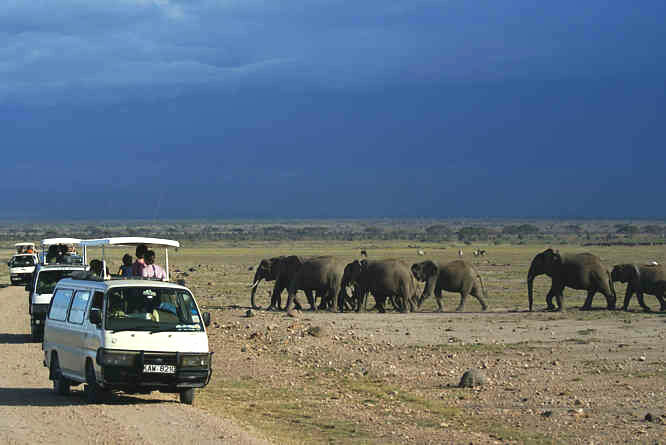 Some tour operator companies only include one safari trip of a few hours a day as part of their package. If you want to go out of the lodge for longer you have to pay extra. An afternoon's safari can cost you as much as 70 British Pounds each. Some of the local drivers have bad body odder, they smell. Being stuck in a hot car for hours on end is not pleasant. Some of your fellow tourists on the same vehicle may be the family from hell with teenaged children who are bored with looking at yet more animals. They are loud and scare away the animals. Once they have spotted the animal they want to move onto the next. They are not interested in spending time to observe the animals in there natural environment in the peace and quite of the African savannah. The main advantage of going with a guide is that he has a radio and learns where the animals are from other tour guides. I found by talking to them they are only too pleased to share information about the most recent sightings of lion or a leopard.